MSRP (CAD): $56.49 *** Please contact us for corporate pricing or login to see web pricing or US$ pricing. There's nothing depressing about the blues when they're printed using Fargo's 44203 Monochrome Custom Resin ribbons and your Fargo DTC 300 printer. This colorful ribbon is so reliable and easy to use, you'll be glad you chose to go with the industry leader. You'll get the same sharp text, images and barcodes that have made Fargo an industry leader for years. These ribbons offer a 1000 card output, providing a very low cost per card. 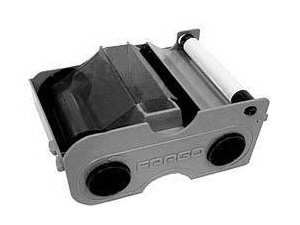 And because Fargo's 44203 ribbons include a Cleaning Roller and RibbonTraq technology, your printer will operate more smoothly while all but eliminating down time and card waste. For optimal print quality and the most accurate printer/encoder functions, businesses around the globe choose Fargo Certified Parts and Accessories.